Ever since I got into VR, Fallout has been a series I’ve been clamoring for the play in the medium. Needless to say, I was pretty excited when Bethesda announced they would bring Fallout 4 to VR. After a few delays, we finally have Fallout 4 VR and for the most part, it was all I could ask for in a VR game. Bethesda had a tough job to try and retrofit the Creation Engine into being able to be played with an HMD. I couldn’t imagine how much they had to go through to try and convert an incredibly large game such as Fallout 4 to VR. Contrary to popular belief, it’s not an easy task to do. As a programmer myself, my mind just wanders into all the things that could go wrong, small and large so I appreciate the effort that Bethesda went into trying to “VRify” Fallout 4. Sure, there are still plenty of problems, but Bethesda has done a very admirable job with this release. Supporting only the HTC Vive for now, Fallout 4 VR really lets you immerse yourself in the Boston Commonwealth. When I played Fallout 3 and walked outside of the Vault for the first time, I stood there and just stared around in awe of what I was seeing. The same thing happened to me when I started my playthrough of the game. I felt like I was standing in the middle of my house as I looked around. I truly did. There are plenty of moments like that where I was really taken aback by what I saw. Playing in VR is a brand new experience that really takes the immersion level of an open world Bethesda game to a whole new level. And it also changes how you play. For example, one of the first quests has you clearing a band of raiders from a factory. Normally, I would just run up and start gunning anyone and everyone one around me. With Fallout 4 VR, I found myself trying to be more strategic. As I walked up to the area, I noted where some of the raiders were and got their attention. I actually decided to hide myself behind a brick wall and proceeded to peek around to pick them off one by one. I physically crouched way down in order to hide behind this low wall and I physically leaned around the corner to try and get a better shot. Yes, you can do this in the flat version of Fallout 4, but it feels so much more natural to do this in VR and you’re not fumbling around with key presses to do this. It’s all done physically and it’s second nature when you’re using the Vive since you feel like you’re in the world, you’re going to act like you were normally do if you were really there. And it all gets translated pretty well to the virtual world. If you thought the ghouls, raiders, and deathclaws were scary, seeing them in VR can be truly frightening. While I was leary of ghouls when they did their quick lunge at me, seeing them do this in VR took it up a few notches. There were plenty of times I literally jumped when I turned around to see a ghoul or raider in my face. Those areas with the creepy mannequins are made much more unnerving when you walk by them in VR. Yes, playing the game in VR makes everything much more impactful. Speaking of movement, Bethesda did a great job in giving players both teleportation and locomotion. The former is limited by your action points so you can’t just teleport long distances all willy nilly. You’re going to have to spend action points to teleport a few feet away while closer teleports won’t drain your action points. It simulates a walking/running mechanic of the game, which works pretty well. If you can stomach it, the locomotion movement is the way to go and it makes traveling around the Boston Commonwealth so much fun. I had no problems using the D-Pad to move around and circle straft enemies as I gunned them down. It didn’t take me long to get used to moving this way and I was easily traversing the game world as if I was using a mouse and keyboard. Firing a gun, for the most part, is very satisfying but can be somewhat frustrating at times. Your right controller controls your weapons and yes, there is a difference if you hip fire or aim down the sights. There’s still an RPG element to it where the bullets can spread randomly when you aim down the sights and a lot more so if your firing from the hip. It’s because of this that can put some people off because they expect bullets to go where they aim in VR instead of having some RNG associated with it. It took me a little time to get used to some of the randomness, but I’ve come to find it to be an enjoyable aspect of the game. If you do want a more consistent result from aiming, there’s a mod out there to minimize the RPG effect of shooting. 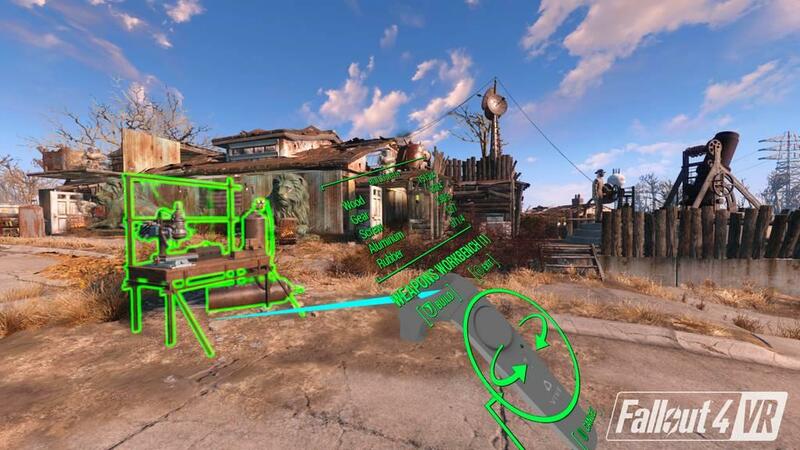 A few issues come into play with guns in Fallout 4 VR. One, there is very little feedback in terms of vibration when it comes to firing guns. In other games, I notice that I’m unloading rounds upon rounds on this one. I barely notice it in Fallout 4 VR. It’s very subtle, but I think this aspect can be improved upon in future patches or a mod. Two, scopes don’t work at all, thus limiting the sniping ability in the game. All you get is black when looking down a scope, which is really disappointing. I’m hoping they fix this issue soon with a patch, but for now, don’t plan on sniping at all with any of the guns. Three, there are no two handed weapon modeling in the game. I know some folks were really hoping to hold a minigun with two hands, but not here. It’s similar to how Serious Sam VR is, where the large guns freely move around with your right hand. To me, it’s not that big of a deal though and while I understand that VR is all about immersion, I’m fine with having some leeway in this area with the game. Four, there’s no manual reload. Now, this is a nitpicky one, but if you’ve ever played a shooting game with manual reloading, it’s really fun. That said, I don’t mind pressing the palm button to just reload and it honestly doesn’t bother me one bit, but I thought I’d mention it. With Fallout 4 VR, I found myself using grenades and molotov cocktails a lot, lot more. Just being able to roll a grenade or do a long toss and having that option available to me by physically doing a throwing motion really makes using grenades much more satisfying. Yes, it can be tougher to judge how short or far you’re going to throw one, but it makes it much more fun to use in my opinion. Now, those who are fans of Fallout I’m sure dreamed of having a Pipboy on their arm and being able to view it just by holding it up to themselves. 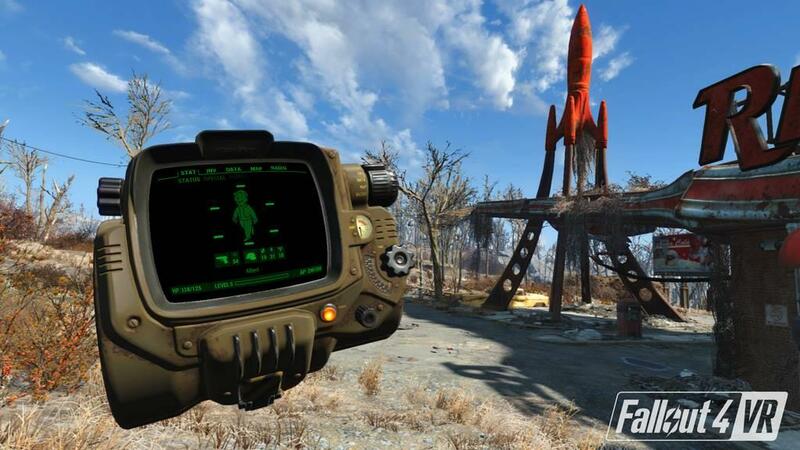 Fallout 4 VR realizes this dream as you can bring up your Pipboy this way. Rotate your left arm, bring it to view, and in comes a large display of the Pipboy interface. You can cycle through the various menus with the D-Pad, but that can sometimes be unresponsive as the D-Pad selection seems inconsistent. Nevertheless, it was pretty cool to be able to read the Pipboy this way and fun for a few moments. I do wish that the game showed virtual arms as well as your body when playing so you could look down and see the clothes you were wearing as well as helping the immersion level. The omission of a virtual body and limbs does break you out the feeling of being there at times, but when the action is hot and heavy, I couldn't care less I wasn't able to see myself. In the end, I decided to just setup the option to bring the Pipboy into view by pressing a button. Yes, it’s not as immersive, but it sure saved my tiring arm. Whether you go with the arm motion or button press, seeing the Pipboy in front of your face is pretty awesome. So we all know that the Creation Engine isn’t the smoothest engine around, and because of this, there are performance issues with the game. I am running an i7-6700K with a GeForce GTX 1080 and 16GB of ram with Windows 10. Initially, there were a lot of visual issues such as blurriness and stuttering when playing. A few patches by Bethesda has improved the clarity and performance of the game, but I’m still getting a large amount of reprojection when playing. I’m getting in the neighborhood of 70% reprojection in VR. It’s not THAT bad when playing, but you can see many instances of performance issues. I’ve tried a few tweaks found in various forums that’s helped a little bit and I’ve ran some scripts to turn off the Windows 10 Xbox Game Bar, but it’s far from 100% smooth. In reality, I expected this because let’s face it, the game wasn’t made with VR in mind and the engine isn’t made for VR at all. To have the game run at all with the HTC Vive is a major accomplishment that I appreciate. Hopefully, Bethesda can do more to eek out performance for the game and make it a more pleasant experience. Another small issue I've run into is that some actions seem to stick even when you aren't pressing a button or using the D-Pad. With locomotion turned on, there were a few times where I would glide my thumb off the D-Pad and my character would just keep walking in that direction. I had to put my thumb back on the D-Pad in order to stop. Another time, my guns would fire without me pressing on the trigger or continue firing on its own, causing some headaches in friendly areas. It only happens in Fallout 4 VR and none of my other games, so it leads me to suspect there's something there rather than being a hardware issue and I've read a few others seeing this problem as well. Bethesda is charging $60 for the game and it doesn’t include any of the DLC. To me, that seems a bit overpriced though for those that own the non-VR version. I think a discount for those with the flat version would’ve been the way to go here. Also, I hope the DLC becomes available to all those that purchase this and that they don’t charge again for the six pieces of extra content. I mean, you can grab the Fallout 4 Game of the Year Edition for $60 or $30 on a Steam sale. Making people pay for the DLC would not be a wise decision, in my opinion. Guess we’ll see what happens once the DLC becomes available. Even with the performance issues and crashes I experienced, Fallout 4 VR is an incredible experience. To have a AAA title be playable entirely in VR and somewhat comfortably at that, is such a joy. As a huge fan of the universe, it’s a dream come true to be able to be fully immersed in a Fallout world. I really hope Bethesda continues to improve on the performance and gameplay and try to make this the best it can. If you’re reading this Bethesda, consider putting in Virtuix Omni support so I can truly walk around in the Boston Commonwealth. That would really take it over the top for me. For now, Fallout 4 VR is one of the more complete VR experiences out there and once I will be spending many, many hours on even though I’ve already played over 130 hours on the regular flat version.